Lee’s Summit, Missouri lies within the counties of Jackson and Cass. It is the sixth largest city in the Kansas City Metropolitan area and in the state of Missouri. Lee’s Summit has a population more than 90,000 residents and it is in the southeast end of the Kansas City Metro area. 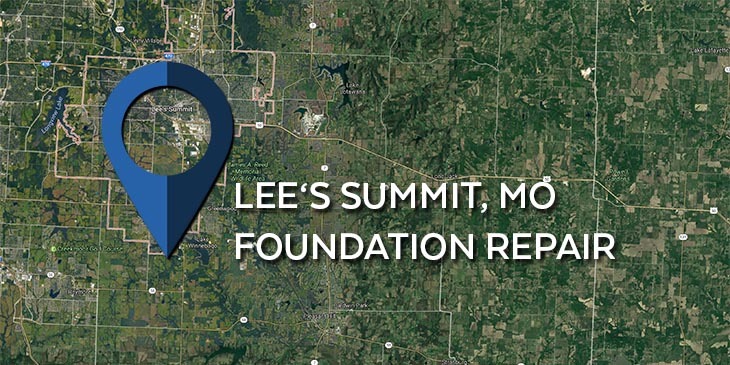 According to CNN/Money, Lee’s Summit is 27th on the list of 100 Best Cities to live in the United States in 2010. We serve customers throughout Lee’s Summit, MO to ensure their homes are safe and sturdy. Over a hundred years ago, Lee’s Summit consisted of an 11 block Town of Strother that straddled the Missouri Pacific Railroad tracks. It wasn’t until the late 1800′s when William B. Howard was drawn to this fertile, gently rolling land with a dream of building a city. It is now heavily populated and is a progressive, yet restful and family-oriented community atmosphere. Downtown Lee’s Summit Main Street was selected as a Great American Main Street Award Winner by the National Trust for Historic Preservation in 2010. Lee’s Summit is a wonderful city to live in, but if your home is having foundation problems such as cracks, leaning walls or chimneys, or a sinking foundation; then you need to have a professional take care of the issue. K.C. Pro can solve your foundation repair problems to keep your home safe and sound. Soil-related disturbances tend to be a large factor when needing foundation repair. Poor compaction, overloading, and excessive materials that expand and shrink with the changes in the moisture content greatly impact the amount of stress on your home’s foundation. We will use the best products in the industry, provided by ECP, to guarantee that your home is back to it’s original condition. We will use Helical piers, steel piers, and the proven process of foundation underpinning to guarantee that you will not need additional repairs for many years to come. KC Pro has several foundation repair systems to overcome the damage already done. Foundation damage and water seepage often go hand in hand. When there are cracks in basement and foundation walls then moisture can easily find it’s way into your home. If not addressed this could result in mold growth, rotting wood, and damage to personal belongings. Finding a trustworthy company to take care of you home is the most important part about waterproofing. Find out what K.C. Pro can do for you! Along with foundation repair, KC Pro offers you the services of basement waterproofing as well. We have many waterproofing services from exterior waterproofing to wall crack injections. Don’t hesitate to have us come in and take care of your basement waterproofing problems. They need to be handled as soon as possible, so have us come in and check it out. If you are in need of foundation repair or in any of the surrounding areas, then contact us today at KC Pro.